The beauty item that came with the other boxes this month was a creamy eye sheen in one of four colours, and the Modern Beauty Box had that and an Ink Gel Eyeliner. Those sounded like awesome products, but I already have my prefered brands for eyeshadow and gel eyeliner so I decided to pass and stick with my 3-polish It Girl box. 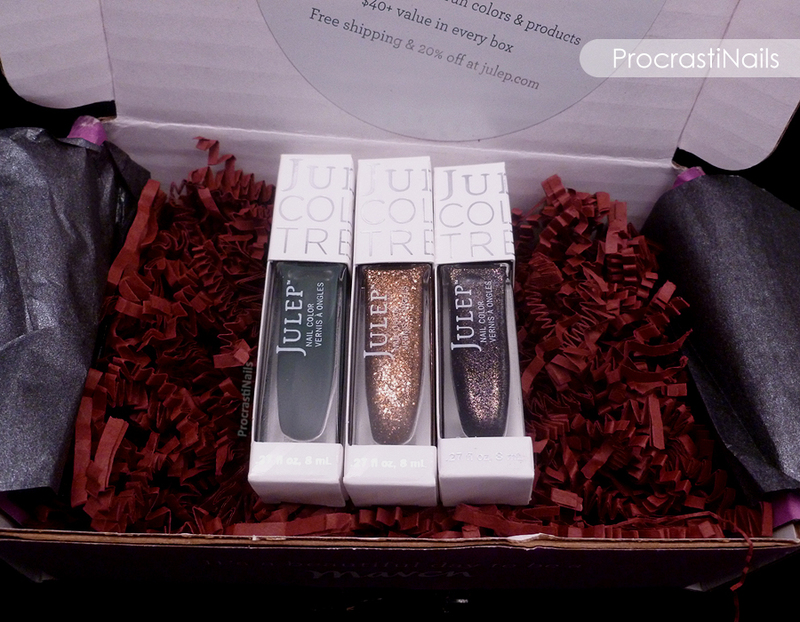 The boxes all came with some discount codes, so if you're interested you can use the code SHEEN10 to get 10% off on one of Julep's eye sheens, and code ALIST20 for 20% off on their A-List Eyeliner Duo (which contains the gel eyeliner and an angled brush). Both are valid until March 1/14. One other nice little bonus that came with this month's box was a BOGO code to be used on a polish for yourself and another polish for a friend. Or at least that's what they suggest! ;) The code is BEMINE and is also valid until March 1/14. 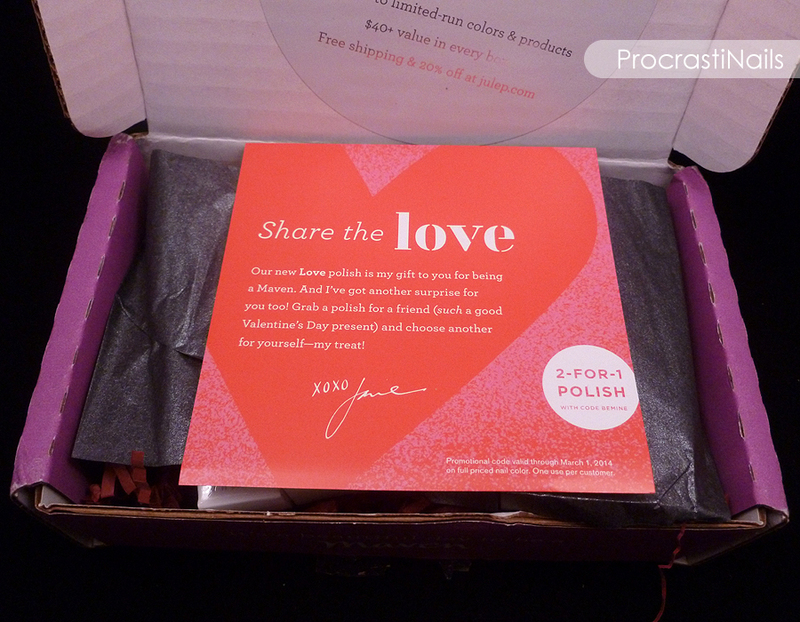 As you may have read on the BOGO card above, this month's free gift was a special polish from Jane to all her Mavens. An exclusive shade called Love! The only way you could get it was if you took your Maven box this month. :) I took some swatches of this polish along with the others so keep scrolling to see what this beauty looks like on the nails! Now, let's take a closer look at all these polishes! 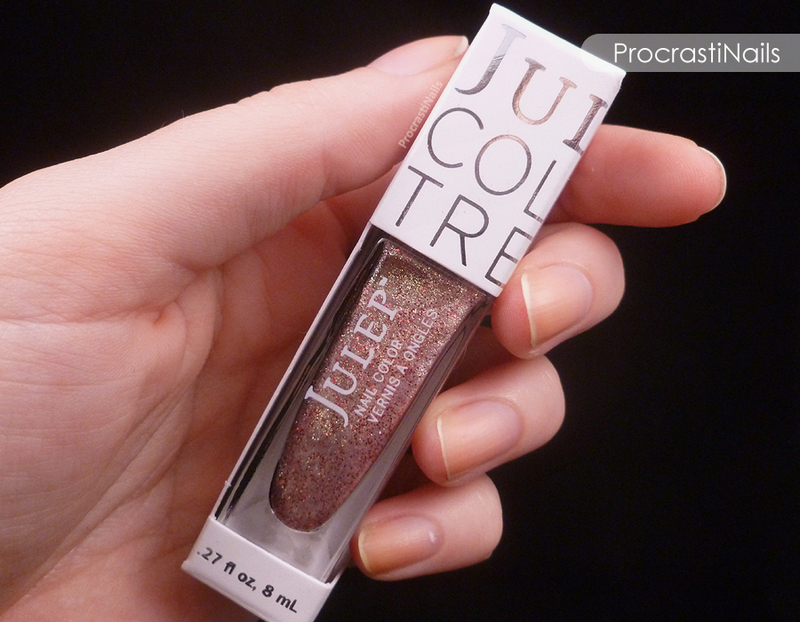 Julep Diamond Theory was the shade I was most looking forward to this month, and it didn't disappoint. It's described as a "full-coverage multidimensional copper glitter" and this is one of those times when Julep says it's full coverage and it's actually full-coverage! I felt like I was wearing gold on my nails when I had this on, seriously. Decadent and sparkly and rich. It's made up of a combo of large and micro glitters suspended in a clear base, and this is PACKED with glitter. If you look close you can actually see some of the glitters lean more towards gold, and others towards copper. 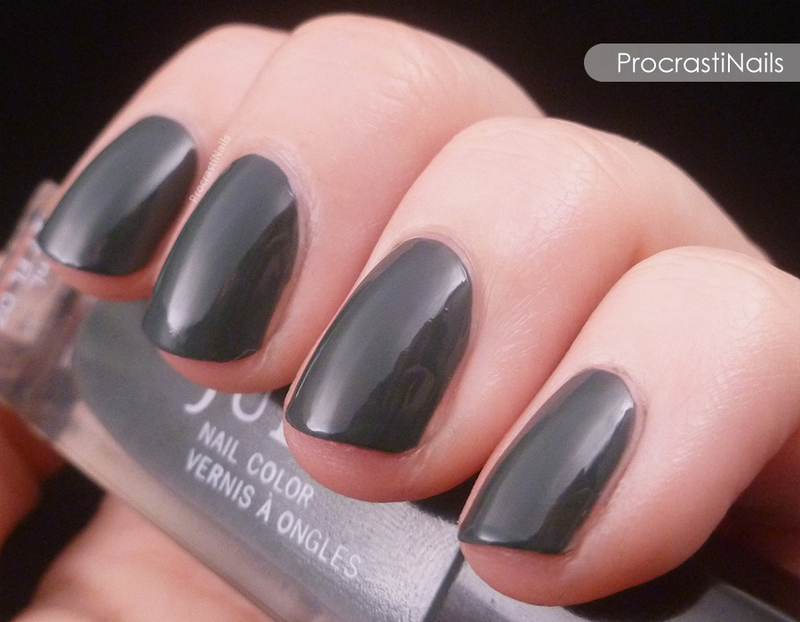 I think that's part of the reason this polish comes out so striking. Definitely my favourite this month! Pictured here is three coats. 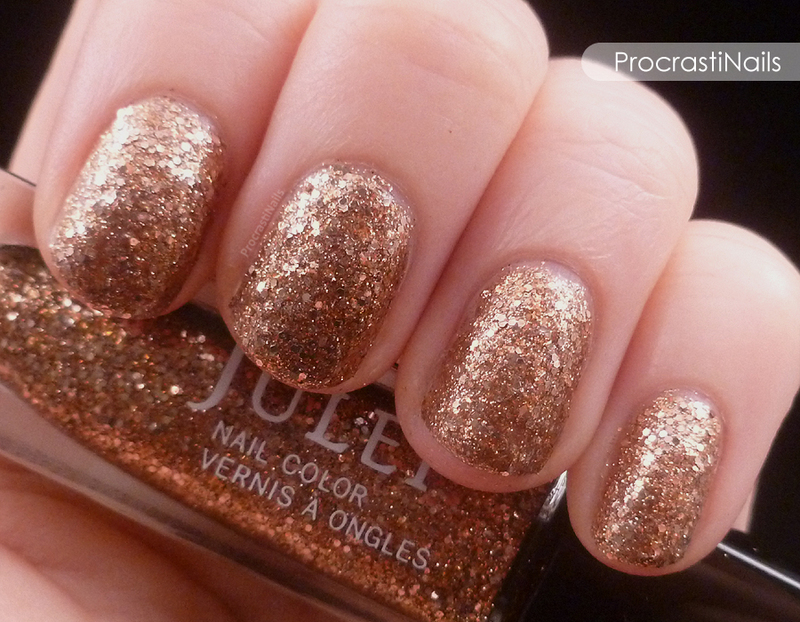 This month Julep brought out a new finish for us that they're calling a Stardust Finish. It's their version of a sparkly textured glitter. The shade in this box is called Glam Roc and is described as a "midnight purple & gold stardust." 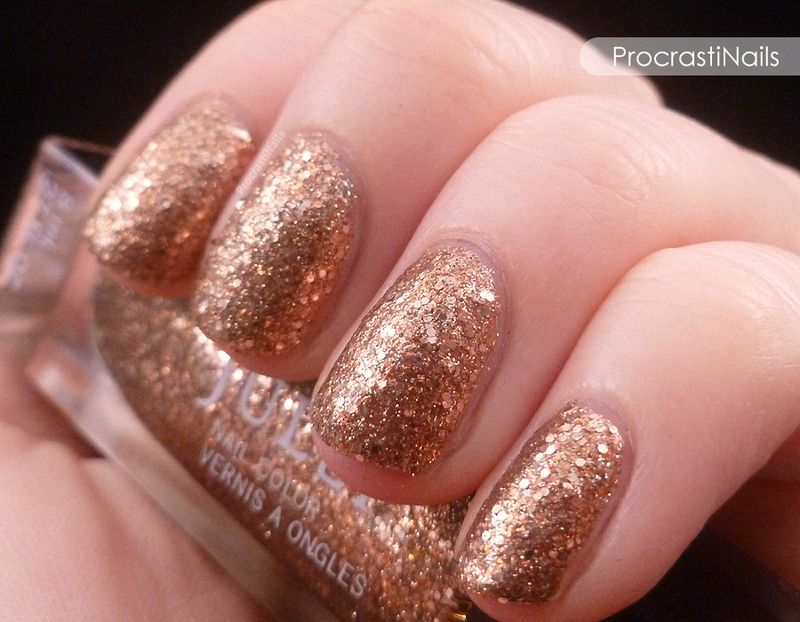 This is a very pretty polish, and the gold sparkles shimmer in the light when you move your hand around. I wish I could've picked up just how sparkly this shade is, but my camera wasn't cooperating. 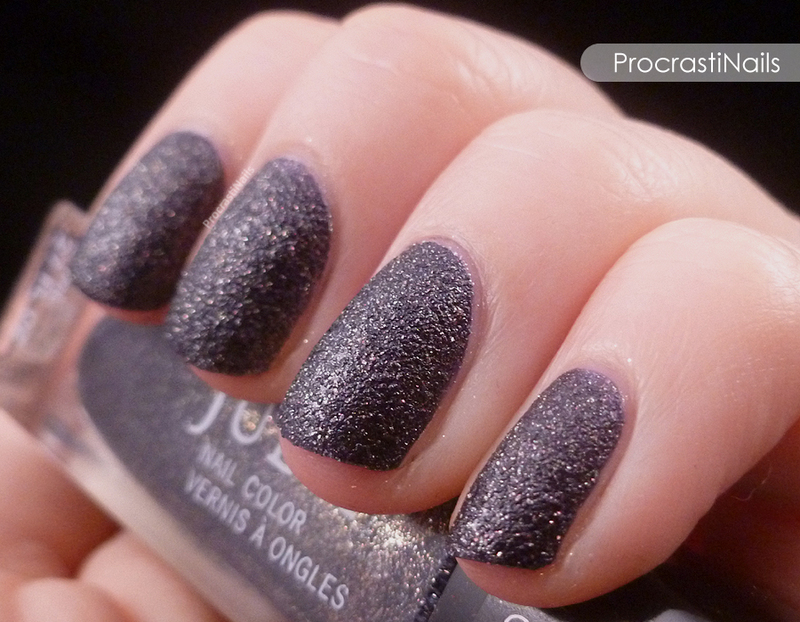 Pictured here is three coats, and like all of Julep's textured polishes it went on beautifully. They should stick to the more creative finishes, they do them well! The last colour I have to show you is Jane's special gift for the Mavens. 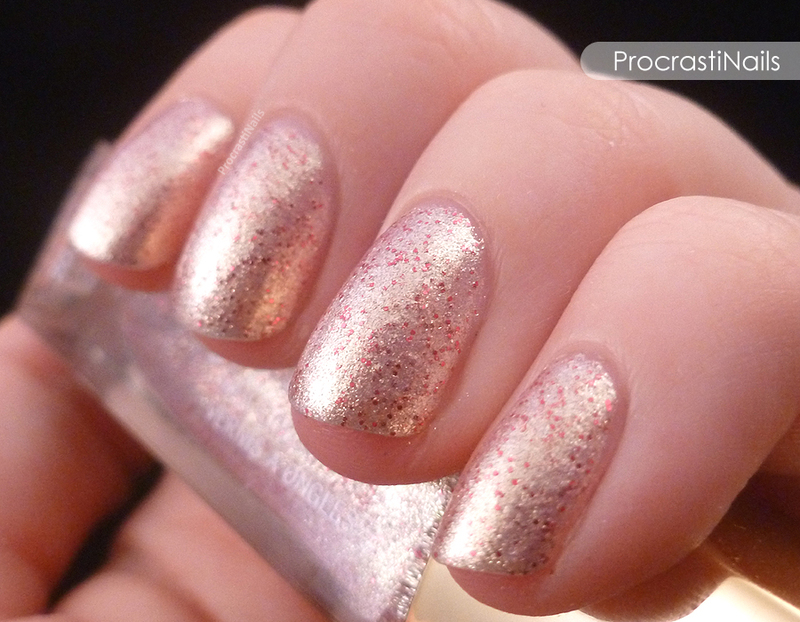 It's a beautiful full-coverage microglitter called Love. Isn't that a cute name for a Valentine's shade? :) It's described as a "Gold, pearl & fuchsia microglitter," and like I said earlier if you didn't get a box this month you're out of luck when it comes to getting this shade. In the right light the microglitters create a golden pearl/pink duochrome, and the fuschia glitter scattered throughout is just enough to give it that extra pop. Pictured here is three coats, and this polish wasn't as sheer as I expected at all! That being said: since I had to cut my nails down to nubs because of a break anyway, there wasn't much visible nail line to show through. So if you have a very white/distinct nail line you might want to start with a white basecoat just to be safe. I like how all these shades work together as a cohesive collection. 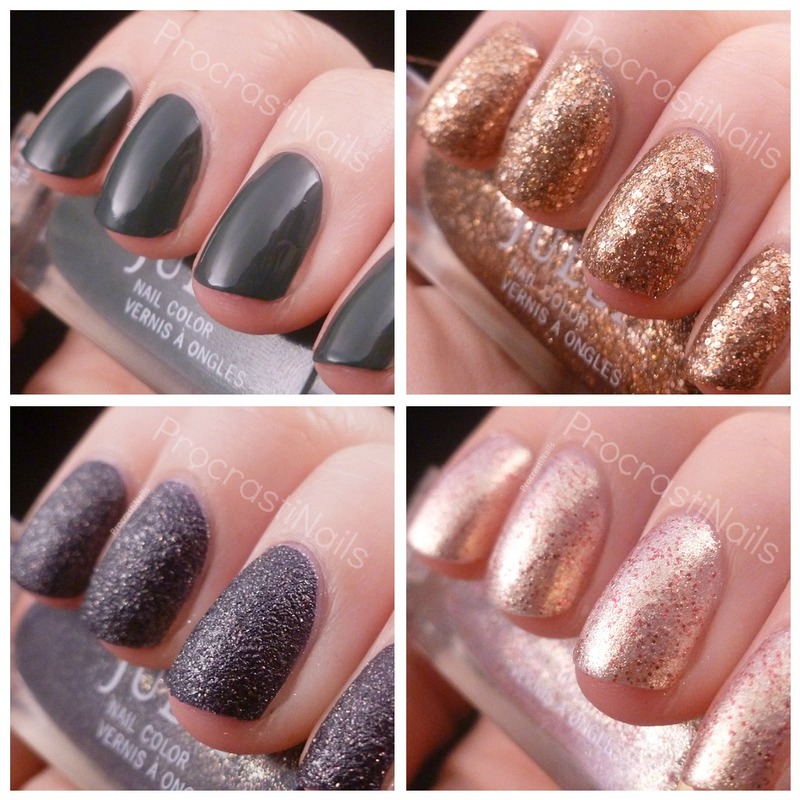 All together they have a very rich and decadent feel, and they're definitely dramatic! These polishes retail for $14 each ($11.20 Maven price), and this entire box for February (with the exception of Love) is up now in the Jule Box section for $19.99. In general the monthly box program is $19.99/month and you get either three polishes, two polishes and full size product, or two full sized products depending on which beauty profile you choose. 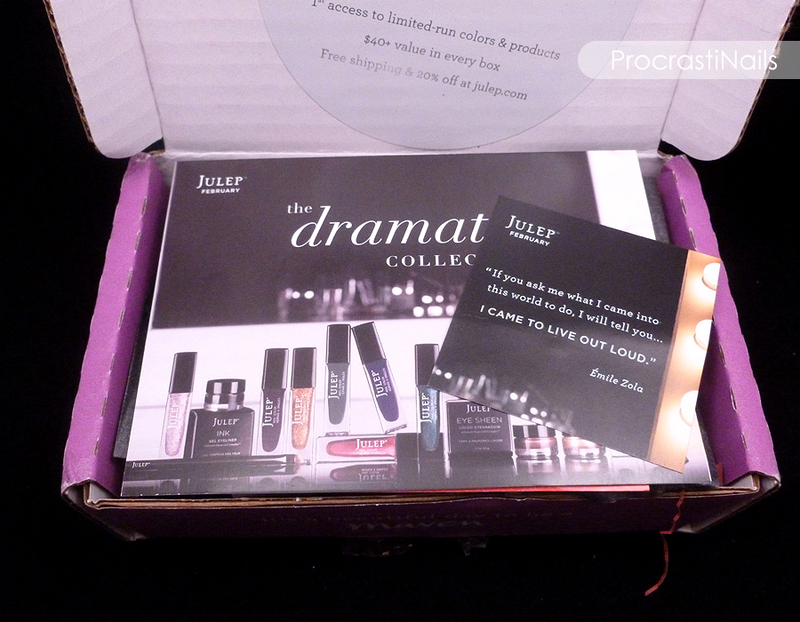 Julep ships to Canada and the US and as a Maven you get free shipping.. If you're interested in signing up for the Julep Maven program you're welcome to use my referral link, and remember to use the code FREEBOX at the checkout to get your first month free! I feel like I say this a lot, but I was pleasantly surprised by the box this month! So many fun finishes and colours, and so. much. glitter. :) What about you, any favourites? Did you pick up a box this month? Do you wish you had so you could've gotten your hands on Love? Planning on using any of the discount codes? Let me know!! Some very pretty colors in this box! 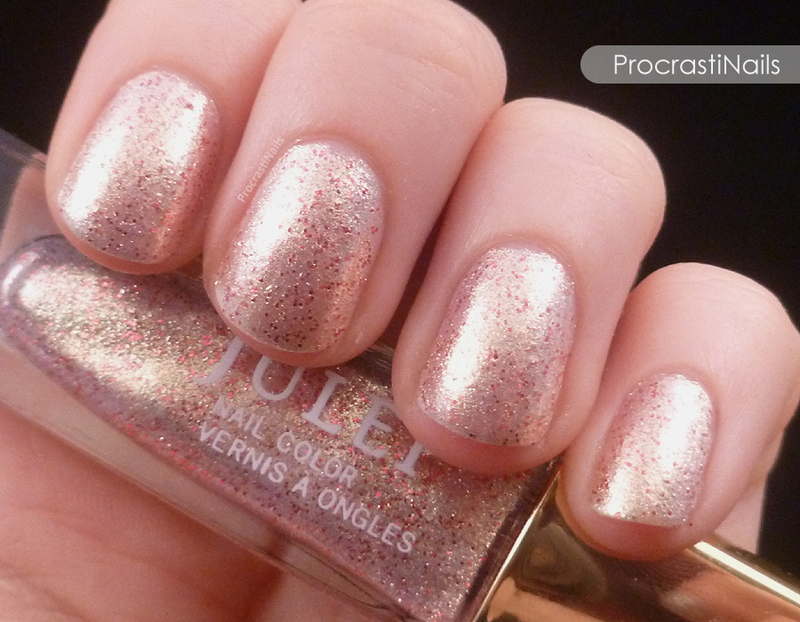 Love that exclusive Julep color in Love too, so nice! Love is soooo pretty! ♥ And Diamon Theory looks very nice too. I'm curious, what are your prefered brands for eyeshadow and gel eyeliner? I'm on the hunt for a good black gel liner and liquid liner atm. My favourite eyeliner is L'Oreal Infallible Gel Lacquer Liner. I have it in two different colours, and it goes on so easily and stays on all day. I don't wear eyeshadow often but when I do it's Urban Decay. I got the Naked 2 palette after it came out and haven't touched any other brands since! What about you?? I haven't found an eyeliner that I like enough to repurchase, it's hard to find one that doesn't smudge or transfer with my hooded eyes (boo!) but my favourite eyeshadows have to be Urban Decay too haha I pretty much only use my Naked Basics anymore, boring as it may seem. It's their February 2014 collection c: Not 2013. Hahahahah!! Oh my gosh, thank you for noticing that! I'll fix it asap!